The Ural has (finally) made it to our house. It is a 2012 Patrol with 18K km that was originally sold in Kansas City and was riden to Fairbanks around the beginning of May. Bridget had walked up to the previous owner at a gas station and he was flabergasted that the first question wasn't "What is it?" but "Do you take any long trips on your Ural?". 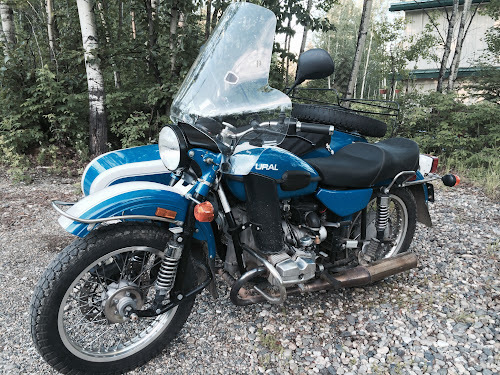 He decided to sell this one since he also has a 2013 Patrol and figured that one Ural was enough. It took a while as the Hall Sensor had failed right after I had called to get more information. He ended up ordering a whole ignition package at the recommendation of Mickey, the Anchorage Ural dealer. He will now put in a warranty claim to be reimbursed for the sensor. The original factory warranty will expire in August but it also has the extended warranty for an additional year. I just took off the sidecar windshield as the previous owner mentioned that it seems to pull to the right. Today was the first time he had ridden the bike with the sidecar windshield installed. It handles completely different from the Beemer/Cozy combination. The steering is light and was a little bit "twitchy" until I loosened up the steering stabilizer. The sidecar wheel lifts easier than the Cozy even though the sidecar itself is heavier. I think that this is due to the narrower track. Maybe I'll put the car battery in the trunk for a while until I get used to the handling. The title of the post came from a comment from my youngest son when I was backing the rig out of the garage for the pictures. Hope you have all kinds of great Foddering ahead! I think that Bridget is pretty pleased with the addition partly because she found the rig even before it hit Craigslist. Congrats to the newest addition to your stable. Have plenty of fun! Thank you! We'll see how the accurate your timeline is. But there is now much more interest in the whole motorcycle/sidecar thing then there ever was in the past. Awesome. Happy Ural Day to you! Looks like Bridget might want to pilot it too. Looking forward to more blog fodder posts when it is out in the wild with you two. 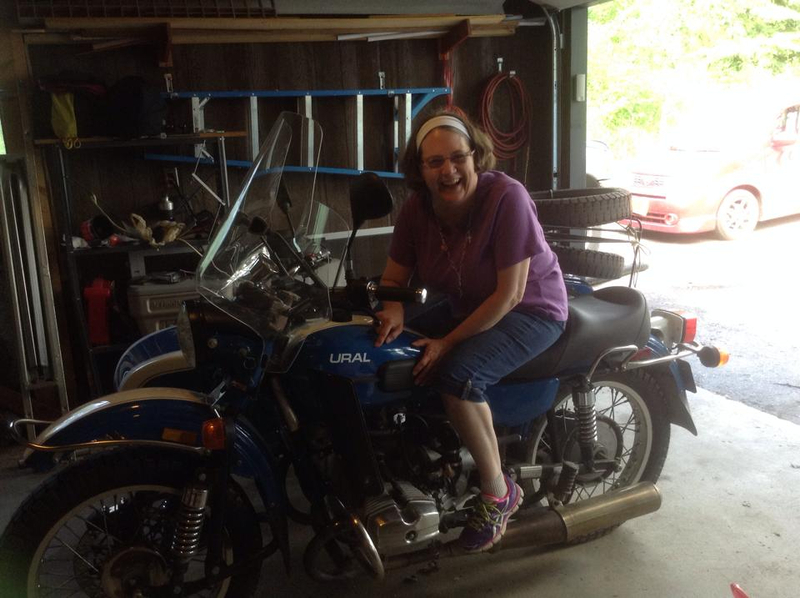 congrats on your new Ural. I like how your family is getting interested in riding the Ural but not the Hack you had. I don't know what the difference is either but it's all good. I have few friends interested in riding so I don't have any riding buddies either. All I ever hear is how dangerous it is and I wouldn't be caught dead on a motorcycle. I heard it again last week about how dangerous it is. Long weekend for you, have fun and go out for a ride . . . 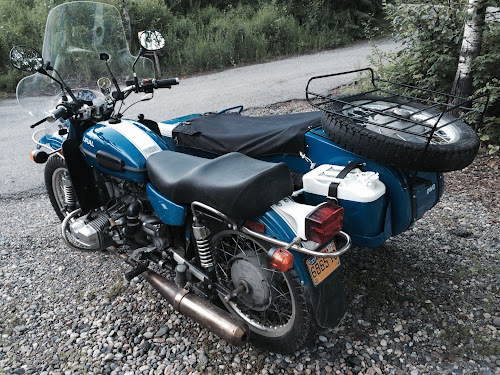 Thanks, maybe because the Ural is still clean and shiny and bright blue. The Cozy is named well as it's pretty small inside for the passenger. Congratulations on the new rig! Should make the snow riding more fun with 2 wheel drive. Looking forward to seeing Ural in the wild pictures. Thank you! Almost looking forward to trying it out in the snow! Congrats and looking forward to your ride reports with the new rig....will you be separating the RT from the Cozy for two-wheeled jaunts? Probably. Already have three inquiries from others on the sidecar especially since it is all set up with the mounts for a twin-shock airhead. I'm late to the party, but congratulations on the new addition. Love the blue! Thank you! 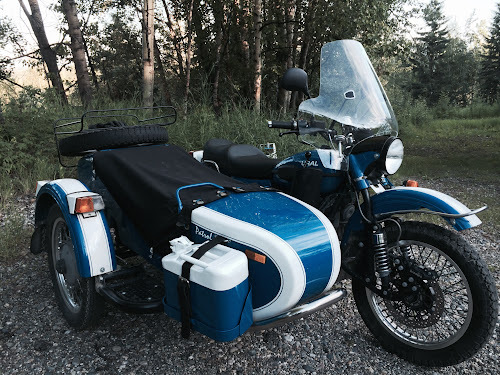 The color seems atypical for a Ural but I like the color.